Signs of spring are beginning to show up everywhere you look - trees and flowers beginning to come to life, warmer days with later sunsets, and even my seasonal allergies are letting me know without a doubt that spring is near! In fact, the calendar shows the first day of "meteorological spring" (defined as Mar-Apr-May) as next Thursday. Another sign of spring is stronger storm systems that typically arrive about twice a week, bringing increasing chances of severe weather. This past Thursday evening, a potent system moved through, preceded by near-80 degree temperatures and very gusty wind and followed by a much cooler but still breezy day yesterday. Fortunately, the ingredients for thunderstorms didn't come together in our area with that one. That may not be the case with the next system though... Below is a graphical view of the possible setup for Tuesday and Wednesday of next week. 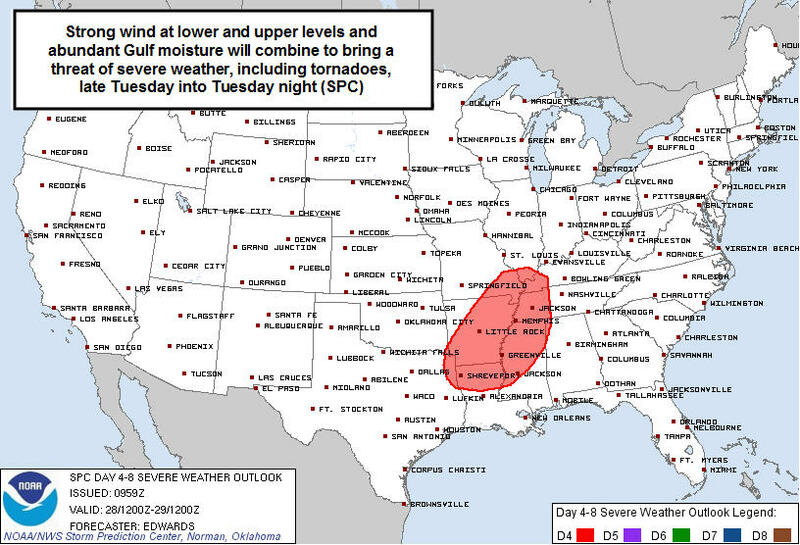 The Storm Prediction Center has highlighted the Mid-South for possible severe weather overnight Tuesday night. Forecast dewpoint map valid at midnight Tuesday night/Wednesday morning. Mid 60s dewpoints indicate very moist air from the Gulf of Mexico - enough moisture for strong thunderstorms. Remember temps also cannot be lower than the dewpoint, so this would indicate possible upper 60s to near 70 degree temps at midnight! Forecast wind map valid midnight Tuesday night (same as above). 10-20 mph south wind - allowing Gulf air to surge north into the region. These graphics don't provide all the details, but for 4-5 days out it gives us reason to keep a close eye on the situation. The timing will likely change a little (especially this far out) and these maps likely won't reflect the exact situation when it unfolds. 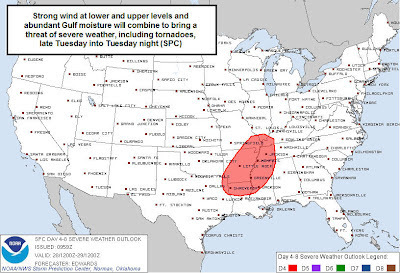 SPC indicates that severe weather COULD include the possibility of tornadoes with this system. 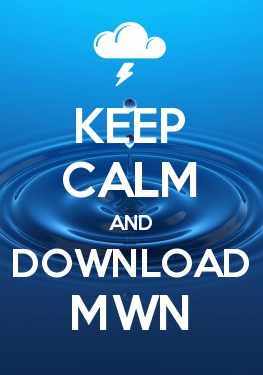 MWN will monitor closely however and keep you updated via the methods at the bottom of the post. Now would be a great time to make sure you are prepared for severe weather this spring. Review the blog posts from earlier this week on various severe weather types and what to do in case severe weather strikes. We also HIGHLY encourage you to have multiple methods of receiving notification of severe weather threats, especially overnight. NOAA Weather Radio is one; outdoor warning sirens may NOT wake you up and are not intended to. The other is StormWatch+ - now available in the MemphisWeather.net smartphone apps for Android and iPhone. This mobile alerting technology will send you an audio alert (that will wake you up if your phone is not silenced and it's close by) and push notification if your location is under a watch or warning. It's personalized weather alerting in the palm of your hand! Learn more and download the app at StormWatchPlus.com.